Church garden. Photo courtesy Osage Mission. Mother Bridget. Photo courtesy Osage Mission. Father Paul Mary Ponziglione. Photo courtesy Osage Mission. The Osage Mission Museum is a finalist for the 8 Wonders of Kansas History because it tells about the Osage Mission, established in 1847, and how it was the most important and influential frontier settlement in southeast Kansas; and its missionaries established more than 100 mission stations in Kansas and beyond. 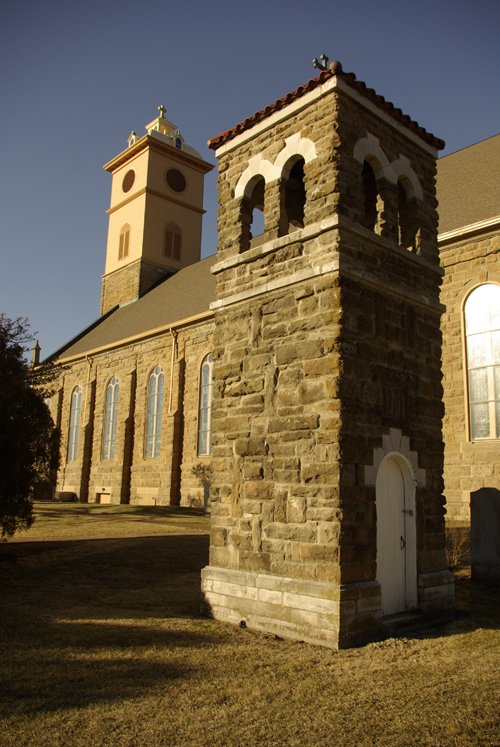 Osage Catholic Mission, now St. Paul, was the most important and influential frontier settlement in southeast Kansas. After its establishment in 1847, it rapidly grew into a gateway for commerce and exploration in the frontier territory. The influence of a handful of Jesuit Missionaries spread Christianity, and elements of their diverse cultures, across more than 100 mission stations in Kansas, Missouri, Oklahoma, and Wyoming. The Osage, a proud, industrious and perceptive nation, knew the white civilization would come and realized their young people must be prepared to adapt. In 1820 the chiefs of the Great and Little Osage sent a delegation to St. Louis to meet with Bishop Du Bourg. They requested that mission schools be established in Osage territory west of the Missouri frontier border and north of what would become Oklahoma Indian Territory. The Bishop was receptive to their request. From these stations, missionaries could set up schools for Indians and settlers, establish more mission stations where settlers could gather to worship, and eventually build chapels and churches. The decision was made to locate a mission near the convergence of Flat Rock Creek and the Neosho River . On April 28, 1847 Jesuits, Father John Schoenmakers, Father John Bax and three lay brothers arrived at what would be known as the Catholic Osage Mission. They immediately established the male department of Osage Manual Labor School. With the arrival of four Sisters of Loretto on October 10, 1847, the female department was established. successful he must educate the Osage girls, not just the boys. The Mission schools would endure like no other in the state. St. Paul's existing public schools sit on the site of the oldest, continually operating school system in the state of Kansas . At no time during this 163-year span has the school missed even part of a term. Survival of the Mission through the Civil War was no small feat. It was essentially located on the territorial North-South line. While Schoenmakers was morally opposed to slavery, he believed neutrality was in the best interest for preserving the Mission. Initially this was very unpopular with both the Union and the bands of pro-slavery sympathizers but eventually the Osage Mission became safe-ground for both Union and Southern troops. The Catholic Bishops could not have foreseen the role of a very small group of missionary priests in the rapid propagation of Christianity and civilization across the frontier region. Several more missionaries followed Father Schoenmakers to the Mission; but the dedication of Father Paul Mary Ponziglione and Father Philip Colleton would become legendary. The Mission schools and the influence of Father Schoenmakers provided the Osage with the education and political savvy to deal with the white man. In 1869, after an intense political struggle with the L.L. & G. Railroad, the Osage ceded their Kansas lands to the government for $1.25/acre and moved to northern Oklahoma. However, this transaction left the Osage Nation with $8,536,000 in the U.S. Treasury paying interest to all members of the tribe. Today, the Osage Nation is one of the most affluent and influential Native American tribes. With the departure of the Indians, Father Schoenmakers realigned his strategy to focus the schools course of instruction to white students. The resulting St. Ann's Academy and St. Francis Institute attracted students from many states and Mexico. The school encouraged settlement and the population grew to 2,500. In 1895, the Kansas legislature approved the change of the name from Osage Mission to St. Paul. During the 20th century St. Paul's fortunes shifted, partially due to the determination of railroad right-of-ways. The population of St. Paul declined and stabilized at about 650 by the end of the 20th century. Today, St. Paul has flourished in the face of downsized population. The town has several new businesses, a new high school and is implementing several municipal improvements. While many of the original Mission and school buildings have disappeared, historical sites remain. The Osage Mission-Neosho County Museum sits on the site of the original Mission and schools. The 126-year-old St. Francis de Hieronymo Catholic Church and its gardens are across the street from the museum. Two historical cemeteries lie within minutes of the museum. The original St. Francis School Infirmary building was relocated to the center of town in 1912 and is now operated as St. Ann's Bed & Breakfast. Learn more at the museum. Open Tuesday-Saturday 9 a.m.-2 p.m.